Dr. Dwight Spearman is a specialist in Pulmonary Disease and Internal Medicine, with a medical practice experience of over 20 years. He graduated from the Kansas City University of Medicine and Biosciences and did an internship at the Summa Health System. 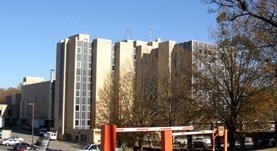 The completion of his residency and a fellowship training program followed, at the University of Mississippi Medical Center. Dr. Spearman currently practices at Eliza Coffee Memorial Hospital in Alabama, accepting various insurance types such as Humana, Cigna, and UnitedHealthcare.